Homocysteine is a waste product of the metabolism of proteins. Homocysteine can build up (kind of like a toxin) when there isn’t enough B vitamins to reduce it, so that it may be excreted. Another common reason why Homocysteine can build up is if you have the MTHFR gene mutation, which is extremely common. Methylation is part of the process that your liver undergoes to remove toxins that pass through it. If you have the C677T or A1298C MTHFR mutation, you will most often times see high Homocysteine levels. Why is high Homocysteine level so bad? A homocysteine level greater than 6.3-7.0 significantly correlates with atherosclerosis. The higher the level, the higher the risk of heart attacks, Coronary Artery Disease and stroke because homocysteine damages the lining of the arteries. High homocysteine levels increase the risk of blood clots (thrombus, DVT). Blood clots can break off and travel anywhere; the brain which causes a stroke, or the heart which causes heart attack. A wide range of disorders, including neuropsychiatric disorders and Autism, are associated with increased homocysteine levels. In Autistic children, high levels of excitatory amino acid Glutamate as well as homocysteine levels were observed. In children with Autism Spectrum Disorder, it was found that highhomocysteine levels were significantly and directly correlated with the severity of the deficit in communication skills. So as you can see here, having this go unchecked can pose a threat to your health! Has your doctor tested your Homocysteine levels? As you can see here, once homocysteine goes beyond 6.3 the cardiovascular threat becomes more real. The problem therein lies, each lab has their own reference range for what homocysteine should be…and it’s already way too high. LabCorp and Quest Diagnostics have their own range for what “normal” homocysteine levels are. These ranges are based on the demographic of sick people that go to each individual lab, and every so often both LabCorp and Quest change their ranges. Functional medicine ranges rarely ever change. Functional Medicine range for Homocysteine is <7.0. How do I lower my Homocysteine level? In the process to metabolize and excrete homocysteine, there is a demand for B6 (P5P), Methylated B12 (Methylcobalamin, not cyanocobalamin), Methylated Folate (Methyl Tetrahydrofolate, not folic acid). 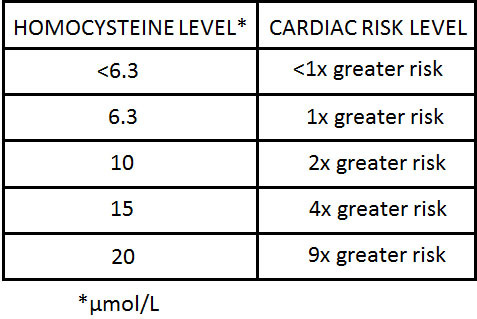 These are required factors in order to lower homocysteine levels. 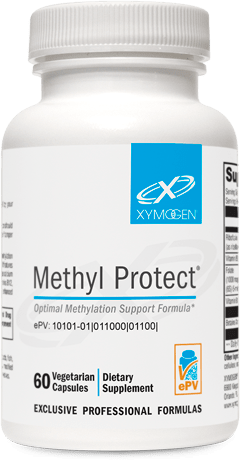 Personally, I take Methyl Protect from Xymogen. This is what I sell at my office and it has specific therapeutic amounts of B vitamins that lower homocysteine. I also have the MTHFR mutation, one copy of the A1298C. This is a client, we checked this person’s homocysteine levels……this is the highest I have ever seen in anyone we’ve done blood work on. This client does one of the biggest things (to excess) that burns through all of your bodies B vitamins…..drinks alcohol! This persons level is 10 TIMES GREATER than it should be! Ask you Physician to have this simple blood test done. It may save your life.